Creations' community art studio and discovery play area are well loved (and well used!) We clean the art studio and play areas daily (1hr commitment) which we would love help with and we try to deep clean once or twice a month (2-3hr commitment). The cleaning and organizing at Creations could involve: putting away and organizing art supplies, washing paint brushes/trays, washing paint off countertops, tables and floors, restocking art supplies bins, putting away and organizing toys in our play area, disinfecting toys and play area games/activities, washing windows, vacuuming, carpet cleaning etc. 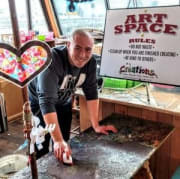 Help Creations keep our art studio and play area clean for all the wonderful children and families that use our space! 4-10 hrs a month. You could commit to clean 1-2 days a week 1hr commitment per cleaning session and/or deep clean twice a month for 2-3hrs.